Grass eating seems to be common among dogs and isn't as odd as some of the other eating practices puppies often engage in. The reason behind this foraging behavior isn't entirely clear, although some dogs just seem to like eating grass. For other dogs, though, ingesting grass may be a way to fulfill an unmet nutritional need or self-induce vomiting to ease an upset stomach. Or they may do it sometimes simply because they're bored. Many dogs have a condition known as pica, which means they eat things that aren't food, including dirt, feces, toys, and grass. Most experts agree, however, that grass eating is normal canine behavior and that this type of pica usually doesn't cause too many, if any, problems. So why grass? It's safe to assume that some dogs simply enjoy the flavor and texture of grass. There's also some speculation that grazing on grass may provide fiber or traces of vitamins and minerals that aren't adequately provided in commercial dog food. The modern domestic dog has a limited diet in general, but its wild relatives continue to enjoy a diverse bounty of food. Coyotes, for example, typically eat vegetable matter found in the stomachs and intestines of prey animals. In fact, many wild canines also eat roots, grasses, and berries in addition to the meat they kill or scavenge. This tendency to eat plants shows up in your dog's behavior too. It's likely that, in addition to grass, your puppy enjoys safe raw-plant snacks, such as sliced bananas, green beans, strawberries, or even apple slices, from time to time. You might also find that your dog turns its nose up at certain raw fruits and veggies, such as broccoli, but really enjoys them cooked. Eating grass doesn't always result in vomiting, but it can sometimes, especially in dogs that don't eat grass regularly. It's possible that these occasional grass eaters are attempting to use it as a natural emetic to stimulate vomiting when they feel unwell. You might notice this if your dog is a little gassy before going outside to do its business or after it's eaten something it wasn't supposed to. Its feces may also be a little runny, discolored, or not normal in some other way, and the dog may look a little down or slightly less energetic than normal. 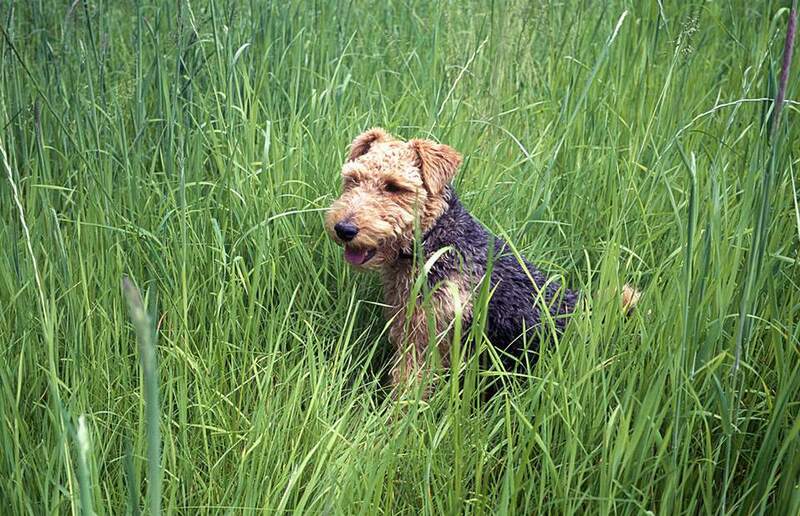 Once outside, your dog with the gassy tummy may begin to gulp mouthfuls of grass. The long, tickling strands may prompt it to regurgitate whatever's been causing its upset stomach. When this is done, it may return to its normal activities fairly soon and show no other signs of illness. Some experts think that bored dogs eat grass simply because it gives them something to do. Quite often, this happens with dogs that don't get enough exercise, particularly young dogs and puppies that have an abundance of pent-up energy to burn. Occasional grass eating isn't a cause for concern. If your dog is partaking of grass because of boredom or a nutritional deficiency, you can make simple changes to add some "spice" to your pup's life and food bowl. However, there are times when you'll need to stop this behavior cold for your dog's safety and other times when it may be a sign that your pup is seriously ill.
Indoor dogs may indulge their urge to graze by nibbling houseplants. This may be a dangerous or even fatal activity, depending on the plant species. To be on the safe side, avoid growing any potentially poisonous plants inside or out. If you can't or don't want to avoid growing plants that are toxic to dogs, keep the plants in an area that your dog can't access. Or work on training so your dog knows which plants or areas are off-limits in your home or garden. Never allow your dog to eat grass that's been chemically treated as this could lead to poisoning. Even if you don't use herbicides or pesticides on your own lawn and garden, your neighbor might. Toxic substances could end up in your yard via water runoff or wind, especially if they're applied on a windy day. This also pertains to public areas, such as parks, where the grass may have been treated. Give your grass-loving pup an alternative to satiate its craving. For instance, you can provide a patch or a container of healthy wheat grass for your dog to munch. Pet-supply stores often have grass- and herb-growing kits available that are safe for dogs as well. Be sure your dog is getting enough exercise each day. This includes physical and mental exercise to ward off boredom. Taking time to play with your dog and work on training daily can make a significant difference in suppressing boredom-related behaviors. A sudden increase in grazing incidence may be a sign that your dog is sick or missing vital nutrients. Pay attention to your dog's activities so you can discuss them with your vet if necessary. Examine the ingredients in your dog's food to see if it's really providing a balanced diet with all the nutrients your dog needs. Changing to a food that's higher in fiber or improves digestion, in general, may curb some of your pup's need for its grassy supplement. If your dog grazes repeatedly for more than two days in a row and vomits every time, this is a signal that you should take your dog to the vet. A chronic upset tummy should be checked out as soon as possible to rule out intestinal parasites, like roundworms, or something more serious like parvovirus or kidney disease.